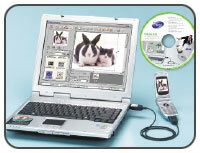 Description: The retail package contains a Handset Manager software CD and a high quality USB interface data cable. This world's most popular Data Suite has the most powerful features and supports the most extensive mobile phone brands and models. It enriches and backups user's mobile contents, provides mobile internet access and works optionally as a power charger. ***Features are phone dependent. Some of the phones only support some of the features. 1: GPRS: Support GPRS Mobile Internet Connectivity for the modem-capable phones. Enclosed GSM/GPRS Modem set-up utility is especially designed for mobile phone users to facilitate Wireless Modem installation and Mobile Internet exploration. 2: Power Charger: USB Data Suite also functions as another handy charger to ease your traveling. Operating systems support: Microsoft Windows 98/98SE, NT, ME, 2000, XP. Maximum transfer speed : 1.5M bps. Mobile phone connection: 115.2k bps. Regulatory compliance: FCC approval, CE marking, C-Tick.